In this Essential Guide, we’ll review Wells Fargo Advantage mutual funds and point to some of the funds that have solid cost- and risk-adjusted performance. If you’re searching for best-performing (or “best”) mutual funds, you will get a few ideas on where to put your money. Wells Fargo has over 370 mutual funds for various types of investors. We covered those funds that have exceeded market benchmarks (for the level of risk assumed) and that have reasonable cost and tax efficiency. Our focus was US equity, and we didn’t review international or bond funds. As always, there could be other great Wells Fargo funds that we didn’t include in this guide. There are many classes of Wells Fargo mutual funds, but the ones that have the lowest fees are Institutional (investment requirement is typically $1 Million) and Class R6 (available on retirement plans). What are Wells Fargo Class R6 funds? Are they a good choice for individual investors? Wells Fargo has a Class R6 funds, which are available to many types of retirement plans, (e.g., 401(k) plans, 457 plans, profit sharing and money purchase pension plans). Class R6 shares are typically not available to retail accounts. Class R6 is attractive because it is sold without a front-end sales charge or contingent, deferred (back-end) sales load. Class R6 has a lower net expense ratio than any other share class and does not have any 12b-1 fees or revenue share fees. There is no minimum initial investment for eligible retirement plan investors (as defined in the prospectus) for Class R6 shares. What products does Wells Fargo offer to institutional investors? Wells Fargo has the Institutional Class of mutual funds. They are typically available to institutional investors, such as corporations, private banks and trust companies, endowments and foundations, registered investment advisors, bank trusts, 529 college savings plan, family offices, and funds of funds. Does the Wells Fargo Institutional Class have lower fees? Typically yes, although not lower than Class R6. Institutional Class shares are sold without a front-end sales charge or deferred / back-end sales load. Is there a minimum initial investment for the Wells Fargo Institutional Class? The minimum initial investment for the Institutional Class is $1 million. This amount may be reduced or eliminated for certain eligible investors. What are the “best” Wells Fargo funds? Can you recommend Wells funds that individual investors should consider as a part of their retirement / 401K plan? We can point you to some funds that have had super risk-adjusted and cost-adjusted performance over the last 5-10 years. There is no guarantee that those funds will continue to perform well in the future. The fund focuses on companies with durable assets, flexible balance sheets, and sustainable free cash flows to protect from volatility caused by cyclical earnings and market swings. The performance / returns have been very good; the fund outperformed the benchmarks such as S&P 500 and Russell Midcap Value Index over the last 5-10 years. This fund now has over $7 Billion in assets under management, and is one of Wells Fargo’s largest mutual funds. Its expense ratio is a bit on the costlier side (0.76%), but the risk-adjusted return justifies it. The Sharpe ratio (a measure of a fund’s risk-adjusted performance) is well above 1, which indicates a desirable return vis-a-vis fund’s exposure. The fund invests in companies with robust and underappreciated growth prospects. This all-cap fund owns more small- and mid-cap stocks than most large-growth funds. A little bit of history on this fund. SGRHX had strong inflows between 2010 and 2012; it grew from $950 million in July 2010 to more than $8 billion by October 2012. The fund closed to investors in 2012 and has since struggled to curb outflows, so it reopened to investors in June 2016. From the performance perspective, the fund did better than the benchmark (S&P 500) for the last 10 years or the last year, but it underperformed S&P for the three- and five-year timeframes. Its 10-year Sharpe ratio (a measure of risk-adjusted performance) tops that of S&P 500 mutual funds. Also, the fund returned approximately 2 percentage points more than S&P 500 in the previous year. The fund is fairly concentrated: top 10 holdings account for 36.7% of the fund’s net assets. This fund now has around $4.5 Billion in assets under management, and is one of Wells Fargo’s larger mutual funds. Its expense ratio (for Class R6 shares) is a bit on the higher side (0.70%), but the risk-adjusted return justifies it. The fund is actively managed, with characteristics similar to the S&P 500 Index. It arguably has a better valuation and earnings profile. The investment process emphasizes value-added security selection as a driver of relative performance. The investment team uses Wells Fargo’s proprietary multi-factor models, which combine valuation, earnings, and momentum measures. They also seek to minimize sector, industry, and company size exposure. The performance / return have been very good; the fund outperformed the benchmarks over the 5-10 years. This fund now has around $1 Billion in assets under management, and is one of Wells Fargo’s larger mutual funds. Its expense ratio is mid-range (0.43%); not particularly high or low. 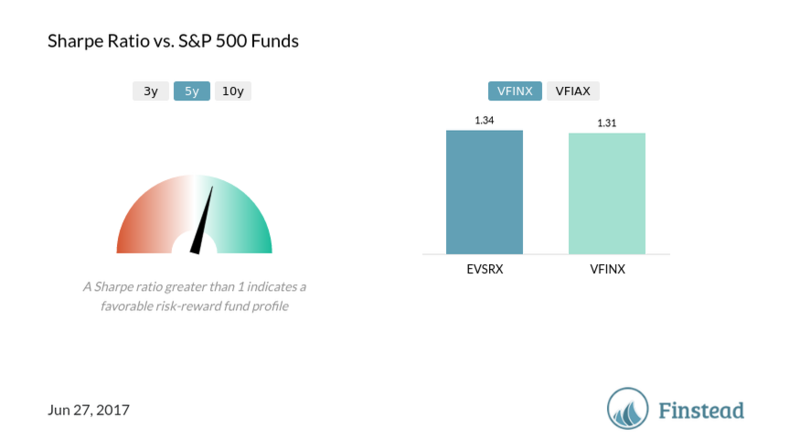 The 5-year Sharpe ratio (a measure of a fund’s risk-adjusted performance) is well above 1, which indicates a desirable return vis-a-vis fund’s exposure. The biggest criticism of this fund is that it is an S&P 500 index ‘hugger’, which means that the portfolio is strongly correlated to S&P 500. That in itself is not a bad thing, but it may not justify higher cost (0.43% expense ratio vs. 0.14% for Vanguard’s S&P 500 Index Fund VFINX). Also, its tax efficiency is average; the tax cost ratio for EVSRX is 0.91%. However, you'll be paying less taxes if you invest in a true index fund (0.67% for VFINX) or even less if you invest in a S&P 500 index ETF (0.5% for VOO), though arguably you may make a lower return as well. The fund focuses on undervalued companies with the potential to deliver future earnings improvements in excess of analysts' expectations. The fund managers use fundamental research for stock selection and implement investment decisions largely based on quantitative analysis. The fund uses Wels Fargo’s proprietary multi-factor models, which combine valuation, growth, momentum, and quality measures. The performance / returns have been very good; the fund outperformed the benchmarks over the last 5-10 years. Its expense ratio is mid-range (0.68%); not particularly high or low. The biggest criticism of this fund is that it may not offer an edge over lower-cost alternatives. 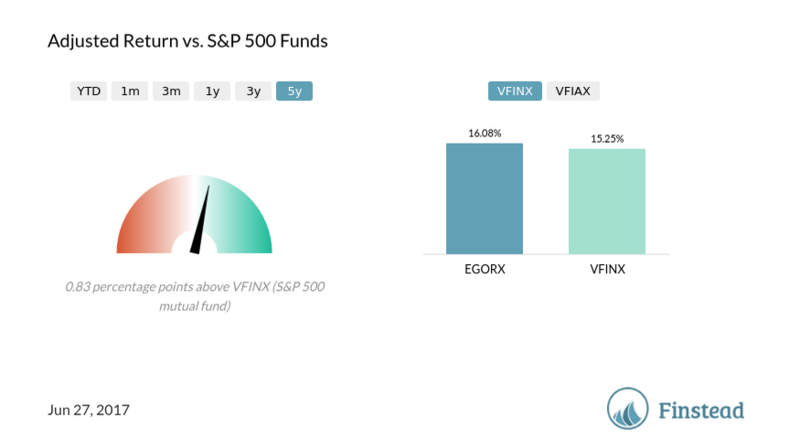 You’ll be paying a 0.68% expense ratio for this fund vs. 0.14% for Vanguard’s S&P 500 Index Fund. Also, this fund has a slightly higher volatility than S&P 500, 5% on average. EGORX is tax inefficient; the 1-year tax cost ratio for EGORX is 1.86% (much above the average for all mutual funds). You'll be paying less taxes if you invest in an index fund (0.67% for VFINX) or even less if you invest in a S&P 500 index ETF (0.5% for VOO), though you may make a lower return as well. Here is a question we get frequently from Finstead users. I’ve recently read an article recommending three Wells Fargo Advantage funds; none of those were listed in this essential guide. How come? First, recognize that for now we’ve focused primarily on domestic equity; we may cover international and bond funds later. Second, we won’t suggest any funds that carry front-end or back-end sales loads, or have expense ratios in excess of 1%. We also don’t recommend funds with distribution (12b1) fees. Third, some of the fund recommendations in the press lack basic due diligence—e.g., performance below the benchmark is considered OK. In this specific article you showed us, there are three recommended funds: Wells Fargo Short-Term Municipal Bond A (WSMAX), Wells Fargo International Equity A (WFEAX), and Wells Fargo Ultra Short-Term Muni Income A (SMAVX). The funds mentioned are Class A, and have an upfront sales load (varying from 2% to 5.75%). We don’t promote funds with sales loads, because a load behaves as a tax on your investment. Instead of putting your money to work, you’re funding the money manager. The Short Term Muni Bond A (WSMAX) didn’t beat the benchmark in the past 10 years, so we wouldn’t recommend it for that reason as well. The International Equity Fund (WFEAX) may be a good one performance wise, but the Class A fees are steep. Instead we’d recommend the Class R6 option: WFEHX. 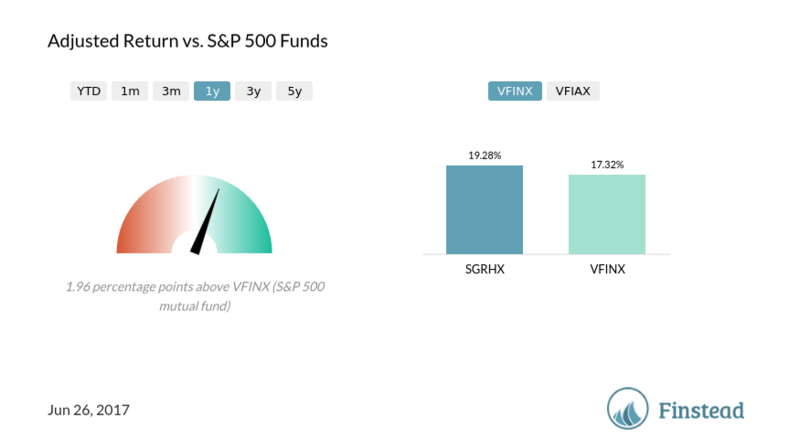 The Ultra Short-Term Muni fund (SMAVX) has really unflattering performance, below the muni treasury benchmark. Our advice—when you see articles such as this one, please do your due diligence before investing. You can wind up wasting a lot of money.